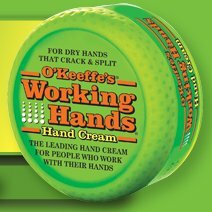 O'Keeffe's working hands is a highly effective moisturizer for severely dry skin that cracks and splits. The odorless, concentrated formula naturally hydrates the skin creating a difference that can be seen within days. This is a great product for anyone working with their hands from contractors to hair dressers to mechanics. Comes in a 2.7oz puck. Lasts a long time--a little goes a long way. Also check out O'Keeffes Healthy Feet for dry feet.